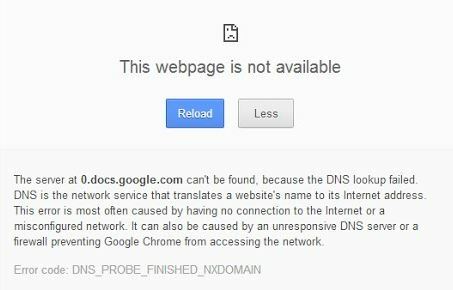 The server at 0.docs.google.com can’t be fount, because the DNS lookup failed. DNS is the network service that translates a website’s name to it’s internet address. This error is most often caused by having no connection to the internet or a misconfigured network. It can also be caused by an unresponsive DNS server or a firewall preventing Google Chrome from accessing the network. I am going to show you three methods of fixing this problem. Try them in the order they appear. I have arranged them in order of complexity. 1. Launch the Services program by clicking on the Start button and then typing “services.msc”, when it comes up in the results, hit the enter key. 2. On the list of services, scroll down to “DNS Client”. Its status should be “started”. Right click on it and choose “Restart”. 3. Close and reopen your Google Chrome browser and try accessing the webpage again. It should work hopefully. It is the same process on Windows 8, but if you do not know how to launch the Services program, here it is. 1. move your mouse cursor to the top right corner of your desktop to bring up the sidebar menu. 2. Choose “Search”, the type “services.msc”. When it comes up in the search results, click to open it. Now we will try flushing your DNS cache, our trusty Command Prompt program will help us achieve this. 1. Launch the Command Prompt program by clicking the start button and then typing “cmd”. Choose cmd.exe or “Command Prompt” from the results. You could also open Command Prompt by opening “Run” (Windows key + R), then type cmd.exe and click ok.
2. In the command prompt window, type in the following command and press the enter key. 3. Now restart your computer, then try accessing the web page. The error should be gone. Here, we are going to completely chane DNS servers to tackle the error DNS_PROBE_FINISHED_NXDOMAIN. Please make sure you have tried the previous fixes above before attempting this one. 1. On your windows task bar, left click or right click on the icon that signifies your network. This icon is usually somewhere beside your battery icon. Choose “Open network and Sharing Center”. 2. When the window opens, look in the left bar, then choose “Change adapter settings”. This would display a list of all your adapters and modems. 3. Identify your current connection from the list. Disconnected adapters / modems would say “Disconnected” or “Disabled” or “Not connected”. Find the one which is currently connected to the internet, the right click on it and select “Properties”. 4. A dialogue box would pop up displaying a list of items used by the active connection. Look for and double click on “Internet Protocol Version 4 (TCP/IPv4)”. If double clicking does nothing, click once to select, then click the “Properties” button. Another popup box. 5. If you look in the bottom section of this popup box (General tab), you would notice two fields labelled “Preferred DNS server” and “Alternate DNS server”. Write the values down somewhere, then replace them with the values below. 6. Click ok to save the new values, but do not close the first box yet. Restart Chrome and see if the error persists. if it’s gone then congratulations, you can close every other thing now. Please let us know if this fix worked for you. If it’s still present, uncheck “Internet Protocol Version 6 (TCP/IPv6)” from the list of items in the first popup box, then click ok.
7. Now restart Chrome one more time to see if Mr error code DNS_PROBE_FINISHED_NXDOMAIN is still around. If he still is, undo your previous actions by checking IPv6 and reinstating your original DNS servers since that did not fix it. If none of the fixes above took care of the DNS_PROBE_FINISHED_NXDOMAIN error or ERR_NAME_NOT_RESOLVED error. Then you may have to uninstall and reinstall the Google Chrome browser. Please let us know which one of the fixes worked for you. Also, if you happened to fix this problem some other way, please let us know in the comments. Thank you for reading.